A few weeks ago, Amazon announced another new service they’ll be offering through their ebook store called Kindle Singles, which is meant to appeal to writers who want to publish something in that magical “in between” word count that comes between standard magazine article length and standard book length. The target size for Kindle Singles is 10,000-30,000 words, but Amazon will accept up to 50,000. With this one simple idea, Amazon has demonstrated why they’re still king of the ebook marketplace — despite the likes of Barnes & Noble and Apple nipping at their heels. The reason why is simple: Amazon is always looking for those niches in publishing that haven’t been filled, and filling them. eBooks on the whole were nothing but a curiosity until Amazon started pushing them with their own proprietary hardware device and made it super-easy to buy and download ebooks straight to said device. Barnes & Noble, Sony, Apple, and everyone else has just been playing catch-up to Amazon, and the fact is, they still are. When the Nook was launched, Barnes & Noble came up with two minor new innovations that Amazon didn’t have: ebook lending between devices, and free, full ebook reading while inside B&N’s brick-and-mortar locations. Amazon can’t match the latter, but they’re already planning a Kindle update that will allow 15-day lending. 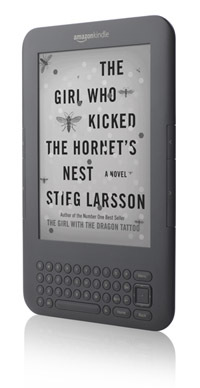 Barnes & Noble has also just launched its highly-publicized “NookColor,” a dedicated ebook reader that features a color display. Amazon has been rumored to be working on a colorized Kindle, but the reports suggest that Amazon wants to develop a color e-ink display. E-ink, which is used in all of Amazon’s Kindle devices, is easier on battery life than other screen types, and most readers find it a lot easier on the eyes, with stronger contrast ratios between light and dark. In essence, e-ink is supposedly better for your eyes than other screens. NookColor, on the other hand, is an LCD display, just like the iPad and other tablet devices. You could say that Barnes & Noble took the quick-and-easy route just so they could beat Amazon to the color punch. Amazon is doing their ebook business smart by always thinking ahead. They have a smart, affordable device of their own, and they’ve put their Kindle software on every other electronic device known to man. Their ereading format is entirely proprietary, but if consumers have no problem with Apple’s iTunes store and its inability to play nice with others, then why should Amazon following the same playbook be an issue? The only stumbling block in Amazon’s way is its Digital Text Platform, the online app that writers and publishers use to submit their books to the Kindle store. Using DTP’s multi-step, often confusing process, is akin to submitting a product for sale to eBay. Barnes & Noble has a more streamlined process, in the recently-announced PubIt app. But the simple fact of the matter is that no one has yet created epublishing’s killer app. Amazon’s system is by far the most popular, but it’s not inviting to would-be ebook publishers, requiring a steep learning curve. If someone were to come along with a web app that makes epublishing point-and-click easy, that could easily penetrate both online stores and brick-and-mortars… when that day comes, ebooks may just kill the printed page. Amazon has done things so smartly up to this point, aside from one thing: the DTP publishing process. If Amazon were to be the one to come up with a super-simple, universally-accessible submission process and ebook format, they could just find themselves with a sudden monopoly on the ebook market. In the meantime, Amazon’s stranglehold on ebooks isn’t going anywhere soon, because they got there first, and they never stop looking for new ways of using ebooks to meet consumers’ needs. You may have heard this week that Barnes & Noble has upped its game when it comes to the fight against Amazon’s Kindle. Amazon has its Digital Text Platform to help writers self-publish their work both in ebook form, and now Barnes & Noble has Pubit, which does the same thing, but claims to be far easier and offer more advantages for writers. Is Pubit all that and a box of chips? Depends on how you use it. Let’s look at the details. The pricing for Pubit structure is set to a graduating percentage of revenue that authors keep, which is clearly structured to encourage writers to price their books under $10. If your book is priced between $2.99 and $9.99, you’ll get 65% of royalties. If your book is less than $2.99 or more than $9.99, you’ll get just 40%. Amazon’s royalty share is split at the exact same price points, but instead of 65/40, Amazon offers 70/35. It’s a marginal difference at the end of the day, and both publishers have their maximum book price set to $200. Neither service allows you to sell your ebook for free (for obvious reasons — these juggernauts need to make a profit). Advantage: a slight edge goes to Amazon. Digital Text Platform claims to support .DOC, .PDF, .TXT and .EPUB files, but admits to having the best luck with .EPUB and files formatted using HTML. I myself have witnessed many instances of .DOC and .PDF files that were transformed into Kindle ebooks that were frankly, with major spacing issues and an overall ugly layout. DTP just doesn’t handle stuff like Word and Adobe formatting all that well, so taking the time to create your own .EPUB file that’s properly formatted is the best way to go. Pubit, on the other hand, has an online converter that (from what I’ve seen and heard so far) appears to work very well for .DOC, .RTF, .TXT, and .HTML files. Pubit offers a Nook emulator as part of the upload/conversion process, so you can preview what your finished ebook will look like. Amazon’s Kindle format may be all the rage, but it doesn’t play nice with other ereaders. On the other hand, virtually every device now has Kindle software available to download and use for free — be it your smartphone, laptop, or iPad — so you don’t have to own the actual Kindle ereader device to buy ebooks from Amazon. Barnes & Noble’s model is very similar, placing your ebook among their online catalog of books, which can be accessed via the Nook device or their free Nook software for all devices. But what B&N has that Amazon doesn’t is brick-and-mortar stores. Take your portable device into a Barnes & Noble store, and you can peruse any ebook in their online catalog in full for free, for up to an hour, and there’s no limit to the number of ebooks you can do this with. Nook also offers lending technology, that lets you share a purchased ebook from your library with a friend for up to 14 days. 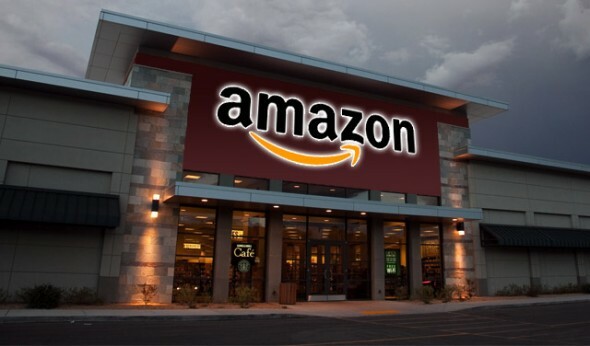 With DTP, your book is automatically added to Amazon’s vast catalog of products; it’s good to be findable on such a humongous database as Amazon’s, yet this advantage can be an equal disadvantage, causing you to easily get lost among listings for not just books, but every product known to man. B&N, on the other hand, is know for exactly one thing: books. Sure, they sell some other products like DVDs and CDs, but you think of Barnes & Noble, and you’re thinking of books. There’s a book-centric identity there that Amazon is far too diversified to match. And you don’t have to worry about your ebook showing up in search results next to hiking boots, printer ink cartridges, or kitty litter. I have to give Barnes & Noble’s Pubit an overall usefulness score that’s higher than Amazon’s. It’s not drastically higher, but it does offer a number of benefits that Amazon doesn’t. But the reality of it all is that if you’re serious about ebook self-publishing, you’re going to want to sell from Amazon and Barnes & Noble both. Fortunately, selling from the latter just got a whole lot easier. As technology advances, art always finds new ways of taking advantage of it. For Music, vinyl records were the first major format to catch on, until cassette tapes came along. Years later, we ditched out cassettes in favor of CDs. Today, the format of choice for most music lovers is the downloadable MP3. The technology got better — with new benefits such as higher quality recordings and instant distribution over the Internet — and the entire art form grew because of it. Movies started out as silent black & white films, then graduated to sound and color. Today we can watch them in high-tech 3D. And recorded movies and TV shows were once on VHS; video tapes gave way to DVDs, and today we have Blu-ray discs and downloadable movies. Even Artwork has adapted and expanded by leaps and bounds, as artists are always finding new techniques and wildly creative new mediums for crafting their art. The Book is the only major art form that hasn’t undergone a change in format since it began. Sure, the technology for printing and binding has advanced over time, but the printed books of today are essentially the same basic medium they’ve always been. Perhaps this is because books have been around a lot longer than recordings of music or film. Those are relatively new inventions compared to books, which have been with us, even in its most primitive form, since around the 5th Century A.D. Before Guttenberg came along, people had to read unbound, handwritten pages and scrolls. Before that, people were carving crude drawings and symbols onto stone and clay. The “pages” changed, but the books remained the same basic concept. Fifteen hundred years of tradition is a hard thing to overcome, after all. There’s a certain stigma of “tradition” attached to printed books, even today; the feel of printed pages in one’s hands is such a beloved thing that books have lagged far behind other art forms in upgrading its medium. At loooooooooong last, times are a-changin’! eBooks have arrived — the publishing world’s version of downloadable MP3s — and they’re here to stay. And we the writers must adapt, or we’ll be left behind as our art form evolves into this new format. If you’re looking to self-publish, or you’re published but you still hold the digital rights to your book yourself, there’s no better format than the ebook. Since it’s merely a digital file with no printing required, it’s an incredibly inexpensive format for selling your work. And the distribution is simple and instantaneous. eBooks also also make for great promotional items. Say you’re writing a series of books. You could give away the first one as a free ebook, to entice readers to pick up the rest of the series. I know many authors who’ve used methods like this one to real success. The bad news is that there are a gazillion ebook formats in which you can choose to create your ebook. How do you know which one(s) to pick the right one? If you’re serious about wanting to sell your ebook, there really are only two formats you need to concern yourself with: Kindle and ePub. You may feel intimidated at the thought of doing this kind of thing yourself, but I’m going to take the mystery out of it for you, and show you how to make both. Kindle’s proprietary format is of course the ebook format used by Amazon on their wildly popular Kindle device. These days, even non-Kindle owners can get in on the fun as well, since there are downloadable Kindle apps for just about every kind of device out there — PC, Mac, iPhone, iPad, Blackberry, Android — which drastically increases the value of Amazon’s ebook catalog. The only downside is that Kindle is Amazon’s proprietary format, and isn’t used by any other ebook publishers or sellers. But Amazon got out ahead of the ebook race by embracing the format very early on, so they have a sizeable lead on ebook sales over everyone else combined. That makes the Kindle format a must-use. Creating a Kindle ebook is very easy, but there are some details that are important to note. First, go to Amazon’s Digital Text Platform website and make sure your contact and billing details are correct. Next, you just need to fill out a simple web form that asks you for chapter titles, cover art, and that sort of thing. Then you’ll need to upload your document. Amazon will automatically convert your document to the Kindle format once you upload it to the DTP website, but this can be a bit tricky. Amazon can convert .zip, .doc, .epub, .pdf, .txt, .mobi, and .prc files into its Kindle format, but I’ve seen some conversions go bad when the formatting of something like a Word .doc or plain .txt file doesn’t create attractive ebook pages. Your best bet to ensure that your Kindle ebook turns out exactly the way you have in mind is to convert it to a PDF and upload in that format. From there, you’ll set pricing details and give Amazon some assurances that you have the digital rights to publish your work. Then it’s just a matter of waiting for Amazon to approve your book and put it up for sale in the Kindle Store. I know that in the past, this process could take a months, but my understanding is that the process has gotten faster and more efficient these days. ePub is the format of choice for pretty much every major player in the ebook business aside from Amazon. You’re purchasing an ePub book if you buy an ebook from Apple’s iBooks Store, Barnes & Noble’s Nook Store, Sony’s Reader Store, and Borders’ Kobo Store. That doesn’t necessarily mean that your readers will be able to buy your ebook from any one of these ebook stores and then read it on any ePub-enabled device or software. Digital Rights Management, aka DRM, is still widely used by most ebook sellers to ensure that Barnes & Noble ebooks work only with Nook software, iBooks ebooks work only with Apple’s software, and so forth. So as the seller, you’ll want to upload your ePub file to each store you want it on. But at least you’ll only have to format it once. There are some professional publishing programs that can create ePub files, such as Adobe InDesign. If you’re fortunate enough to have one of these, then all you need to do is import your Word document (or however you’ve saved it originally) into that program and save it as an ePub document. You’re done! If you need something to make your ePub document, there are a number of open source programs out there that simplify the process. 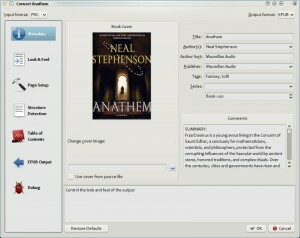 I’m going to recommend one called Calibre, because it’s got a terrific user interface that makes creating ePubs a snap. Now there are a few minor caveats with Calibre, but I still think it’s worth it. Calibre is actually an ebook management program, intended to be used to catalog and keep track of your entire ebook collection. It supports a huge variety of file formats that you can convert to and from, including .epub, but it doesn’t support Word .doc files. Fortunately, it does support .rtf (Rich Text Format) as well as PDFs, so if you save your Word file as either of those, you can easily import them into Calibre and output .epub files. eBooks are not something to be feared. You can do this! With a little effort, you can whip your book into shape for digital publishing, and stay relevant to the modern reader. In the Comments section, please share which is ebook format is your favorite, and why!